Cheesy, kinda Irish & loaded with alcohol. No, not me. This recipe. This is the perfect St. Patrick’s Day recipe, and I’ve been dying to try it for so long. I like making macaroni & cheese in the fall & winter, and I’ve been putting off making this because I wanted to make it for this holiday. So it’s been waiting for this moment for 3 years. Literally. Since I saw it on the Food Network‘s Ultimate Recipe Showdown, I’ve had it printed out and waiting (that and the French Onion Soup Mac & Cheese I’ve been promising to make for Jay). The problem with me is that when I have beer in the house, I drink it, so it rarely ends up in the food. I love beer, especially stouts & lagers. What can I say, I’m mostly Irish, part German, & part Polish (among other things) – all of which are known for having hollow legs. Speaking of ‘Black & Tans’, they aren’t an Irish concept. As a matter of fact, like most watered-down so-called “Irish” traditions, they’re rarely consumed in Ireland. Black and Tan is a drink made from a blend of pale ale, usually Bass Pale Ale, and a dark beer such as a stout or porter, most often Guinness. Sometimes a pale lager is used instead of ale; this is usually called a half and half. Contrary to popular belief, however, Black and Tan as a mixture of two beers is not a drink commonly consumed in Ireland. Indeed, the drink has image problems in parts of Ireland and elsewhere due to the association with the Royal Irish Constabulary Reserve Force which was sent into Ireland in the early 1920s and nicknamed the Black and Tans. Far be it from me to insult anyone (like Ben & Jerry’s apparently did) by making a dish with such a name. But I didn’t invent it, or create it. I just made the recipe. Don’t shoot the messenger. This recipe is easy, despite having lots of ingredients & steps. It doesn’t even bake in the oven, so it takes less time than most mac-n-cheese recipes. For someone like me who hates corned beef & cabbage, the traditional St. Pat’s dinner, it would be the perfect meal to make on the 17th. Place water and lager beer into a 4 ½ quart or larger saucepan over high heat and bring to boil, add pasta and cook until just al dente. Drain and keep warm. Meanwhile in 3 quart saucepan, over medium-high heat, bring the milk, half-and-half, and evaporated milk just to a boil, keep hot. In a 4 quart saucepan, over medium heat, melt 3 tablespoons of the butter and stir in flour until it begins to color slightly, whisk in hot milk, mustard, salt, cayenne, and stout, and bring to a strong simmer. Reduce heat to low and stir in cheeses until melted. Place pasta into serving dish and pour the cheese sauce over the pasta. Place remaining butter in a large saute pan over medium heat and stir in bread crumbs, stir until golden brown, stir in bacon crumbles. Spread mixture over top of macaroni. Garnish with cilantro or sage leaves. Okay so I used Harp lager and Guinness stout for this recipe, but any stout and any lager will do, as long as they aren’t flavored with anything fancy. No chocolate stouts. Just plain old Guinness and Harp are excellent; good, hearty, Irish alcohols. I recommend good quality beer for this- don’t use PBR or Natural Ice or something, please. I’d also recommend buying or making some black & tans to drink with it. Although you can definitely taste the beer in the recipe itself, it’s more fun that way. I have to say this recipe was amazing. 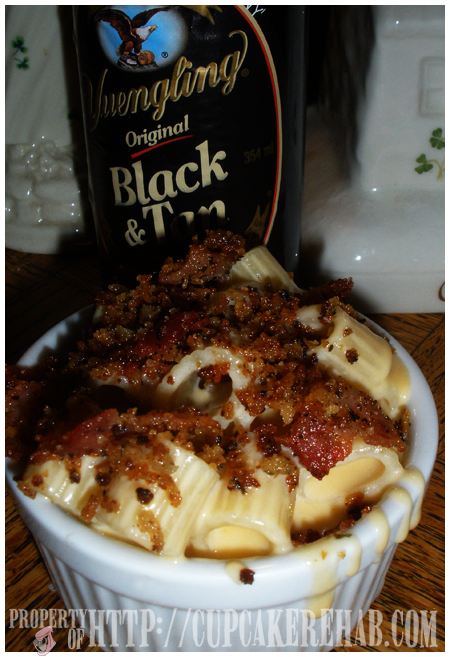 The bacon was a great addition to macaroni & cheese that I’d never done before, despite being the macaroni & cheese queen. And you don’t taste the cayenne- it is not overwhelming. So don’t be afraid to use it. If you can’t find Irish butter or Irish cheddar, you can use regular salted butter and regular sharp cheddar cheese. I made my panko crumbs extra crispy along with the bacon, ’cause that’s how I like it. The bacon, of course, isn’t 100% necessary. But I’d use it if I were you. 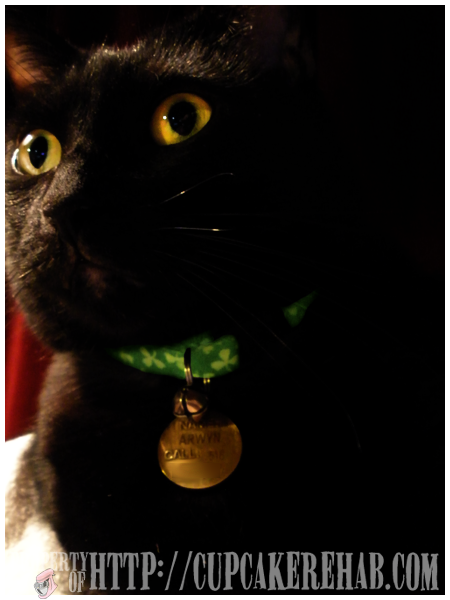 Arwyn, my little black Irish imp, wanted to say hi. Hi! Your macaroni dishes make my mouth water. I want to try this one, for sure! I love stouts and lagers too. Thanks, Amanda! This one is particularly making my mouth water too… it was so good. I think I just found our St. Pat’s dinner! Yum! It’s amazing, and you can taste the beer! Enjoy it Stephanie! By dumb luck, I just pulled “Beer-baked mac ‘n’ cheese from Rackhouse Pub in Denver” from the Los Angeles Times. I’m going to have to make one of the beer macs. I used to regularly make an Emeril’s four cheese mac and cheese, but I’ve gotten lazy since I found this one a couple of years ago. http://www.nytimes.com/2006/01/04/dining/041wrex.html It tastes great, plus there’s minimal pots. I’ve used packaged shredded cheddar, but Cabot’s purple label makes it even more amazing. I bookmarked that recipe, just for nights where I want it but don’t want the mess or big cleanup, thanks! 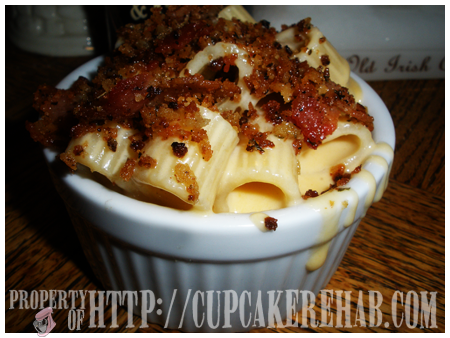 I love macaroni & cheese and I can never have too many recipes. Yeah, you really have to try the beer macaroni & cheese. Especially if you like beer since you can really taste it. simply extremely wonderful. I actually like what you have acquired here, certainly like what you are saying and the best way during which you are saying it. web site; this weblog carries awesome and in fact excellent information for visitors. They’re really convincing and will certainly work. Still, the posts are too brief for beginners. why this twist of fate didn’t took place in advance! I bookmarked it.